The term “first ballot hall of famer” is a sports term. I don’t know about professional sports leagues outside the United States, but in America each of the major sports leagues has their own hall of fame, and every year new members are selected by a group of electors. Many hall of famers don’t make the cut the first year they’re eligible, but those who do are called “first ballot hall of famers” and the phrase is often used to refer to active players who will undoubtedly be elected in their first year of eligibility. Last Friday I attended a Washington wine event outside Seattle and the room was stocked with first ballot hall of Washington wine famers. I fanboyed pretty hard. The occasion was The Auction of Washington Wines. Spread out over several days and several events, it is christened by Wine Spectator as the fourth largest charity auction in the United States. 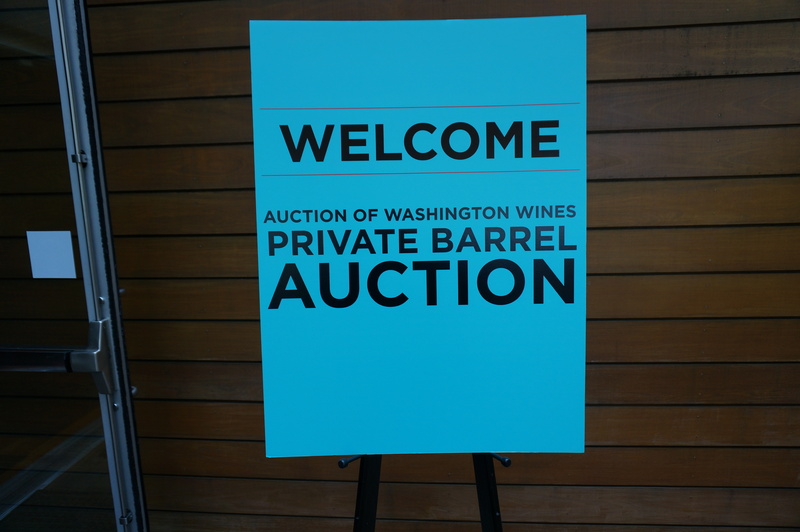 This year was record-setting for the auction, raising over $4.1 million for the Seattle Children’s Hospital and Washington State University’s Viticulture and Enology Program. The event I attended, the Private Barrel Auction, was a trade-only event that a few media types were invited to attend as well. Twenty wineries each donated a barrel of wine to the auction, but the catch was that each barrel had to be a wine that was made specially for the auction and would not be made available to anyone other than the winning bidder, meaning these were unique barrels. We were treated to samples of each in the lead up to the auction, and clearly many of the winemakers had fun with the project. When an industry-leading winemaker gets to play with a barrel’s worth of world class fruit, the results can be good. When they know they’re putting their wine up against their friends and competitors in an auction where the participants are retailers and restauranteurs who are considering only the sellability of the wine, the motivation to perform skyrockets. Real quick, because I know some readers are wondering, the following wineries participated: Force Majeure, Delille Cellars, Forgeron Cellars and The Walls (a collaboration), Mark Ryan, Va Piano, Col Solare, Long Shadows, L’Ecole No. 41, Fidelitas, Woodward Canyon, Sleight of Hand, Chateau Ste. Michelle, Quilceda Creek, Owen Roe, Januik, Pepper Bridge, Brian Carter, Leonetti, Dusted Valley and Betz. All of these, in one room at the same time, with the winemaker from each pouring their unique one-off projects. Holy crap, right? Exactly. Januik was our wonderful host for the tasting and lunch, which was prepared at their in-winery restaurant by their very impressive chefs using a range of local ingredients. We later transitioned to Chateau Ste. Michelle for the auction. Kudos to both for providing barrels and such generous hospitality. I made it through seventeen of the twenty wineries before lunch was served as I enjoyed talking to the winemakers not just about their barrels, but other topics as well, and couldn’t keep pace. The most magical moment came at Sleight of Hands when, after tasting my favorite wine of the day and catching up with one of wine’s most fun-loving personalities, Trey Busch, the legendary champion and producer of Washington wine Bob Betz stopped by to endorse Trey’s talents and have a sip of Busch’s wine with us. I couldn’t pass up that opportunity for a picture with the two of them. The vast majority of the wines came from the 2016 vintage, which Owen Roe’s David O’Reilly told us began early. He has about 10 acres of cherries that he uses as his indicators of when the vitis will kick off, and in his 45 years he’s never seen it start so early. He braced for a really hot growing season, but by summer temperatures had regressed towards the mean. By the end of August, evening temperatures were in the 40s and harvest stalled. This gave the fruit extended hang time, preserving aromatics and flavors. The end result are wines lower in pH than normal with extremely deep colors (this was very evidence in the samples). He described the vintage as “unmistakably ripe, but every element sings at very high levels.” Rick Smalls of Woodward Canyon compared the vintage to those from the days of when he started his winery forty years ago, saying that now, across the industry, consumers are getting real senses of place in Washington wines as winemakers and vineyard managers learn more and more about their sites and fruit. Ted Baseler, president and CEO of Ste Michelle Wine Estates, attributed this evolution in part to Washington State University’s (WSU) Viticulture and Enology Program, saying that when Michelle brought viticulturists onboard not that long ago, they needed five-plus years of training, whereas now, getting them out of WSU, “they’re turnkey.” Baseler, whose prescience of the Washington wine industry is well respected, predicted that in twenty to twenty-five years, the state would see an increase in planted acreage from the 60,000 it has today to 200,000 (nearing parity with today’s Napa). He also predicted a rise from today’s ~900 Washington wineries to 3,000. These are bold predictions, but given the state’s growth to this point, it’s not impossible if current consumer trends continue. The vast majority of wines on offer were cabernet sauvignon-dominate, not surprising for Washington, which is best known for the varietal. The outliers included a 100% grenache dubbed “Duex Dames du Vin” produced in partnership by the female winemakers of Forgeron and The Walls, a very impressive 100% petit verdot from Mark Ryan, a Bordeaux blend featuring majority cabernet franc from Brian Carter, and 100% syrahs from Force Majeure, Sleight of Hand and Quilceda Creek. All of the wines showed like barrel samples, which is to say far from complete integration and with dense, mouth-coating tannins. I’m continually impressed when I see highly descriptive notes from barrel samples as it’s a significant challenge to get into the complexities of young, brutish red wine. From a small but growing amount of first-hand experience, I still take barrel sample scores with a great deal of salt, but that said, there were some real standouts in this bunch. On the cabernet front, Long Shadow’s “Winemaker Selection” blend of cabernet sauvignon, petit verdot, malbec and merlot showed a lot of developing complexity and intrigue that, with ten-plus years, is going to be spectacular. Woodward Canyon’s 100% cabernet from 40-year old vines in Champoux Vineyard had a real presence with layers of savory flavors, cassis, blackberry, mocha and spice. Leonetti’s barrel was filled entirely with cabernet from block 7 in the Mill Creek Upland Vineyard. My first scribble is “oh my, good.” It’s dark, dark stuff with smoke, iodine and bacon that could be mistaken for a syrah at this stage, though it had the fruit, mocha, graphite and mineral core that one would expect from Walla Walla loam soils that I imagine will emerge more prominently and eventually dominate with time. Col Solare’s Estate Blend of 70% cabernet sauvignon clone 2 and 30% cabernet franc clone 214 offered refreshing herbaciousness and spice, and I imagine I’d enjoy this quite a bit in the future. The three standout wines, however, had no cabernet in them. Mark Ryan’s 100% petit verdot was perhaps the most complex varietally bottled PV I’ve had (and it’s still young!). The nose was wild and briary, the tannins lush and already polished. The acid drove this pretty wine, delivering pepper, violets and loads of purple fruit. Quilceda Creek, known for its many 100-point single vineyard cabernet sauvignons, had fun with syrah in an effort that fetched the highest bid at the auction. They delivered what they described to me as “a cabernet lover’s syrah,” evident in its structure and mouth feel. Yet, it offered smoked meat and iron. It was very cool and quite delicious. The wine of the night, though, was Sleight of Hand’s 100% syrah from Lewis Vineyard that was raised entirely in concrete egg. Super funky stuff, it’s my kind of syrah. It’s level of polish and integration was the most impressive aspect of any wine of the day given its youth, and it will develop with time into something truly special. As if this born-and-bred Washingtonian needed more evidence that Washington wine rocks, this event provided ample amounts. What it did expose me to, though, for the first time at such a high level, is the amount of camaraderie that exists at the pinnacle of the industry. No one in the room believed that Washington wine had reached peak quality, and they’re working together as much as anyone could reasonably expect in what is really a foolish effort to summit that mountain. The reality is that the mountain keeps getting higher. Many thanks to The Auction of Washington Wines for allowing me to attend, to the wineries and winemakers for putting in great efforts to raise money for worthy causes, and to my friend Jesse for taking some great pictures.